at Sign & Digital UK. CTR Laser TMX65-E laser machine Sign & Digital UK, one of the leading trade exhibitions for the sign making, display solutions and digital printing industry, takes place in under two weeks time (29 April to 1 May 2014, Hall 2 at the NEC, Birmingham). The organizers have said that once again, the show will act as the launch pad for new technology and machinery aimed at the sign and printing sector. To give a flavour of what will be on display; here are just some of the product launches and prize giveaways that are taking place at the show this year. Atlantic Tech Services (ATS) has been appointed sole UK distributor for the AEG, OEM range of UV printers, solvent inks and media products, with a wide range of products lined-up to make their UK debut at Sign & Digital UK. The AEG Voyger Pro 2050 UV printer will lead the UK launch of the AEG Voyager series. The Voyager range of UV printer’s offer high quality, high performance hybrid printing and the Voyager PRO is one of the first commercially available printers to use the new Xaar 1002 print heads. CTR Lasers is launching a new laser machine, the TMX65-E, designed to work alongside embroidery machines. The floor-standing TMX65-E is billed as a compact, versatile laser cutting machine ideal for those who are looking for a fast and accurate way to cut and trim fabrics after the embroidery work has been completed. 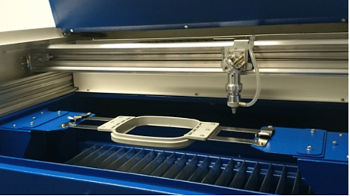 This British designed and manufactured TMX65-E has been specially adapted to work alongside embroidery machines, with custom fixtures to allow for different embroidery jigs to be securely held in place. Fastek has chosen Sign & Digital UK to launch its new range of eco-solvent and dye-sub printers under its own “Samsonn Digital” brand. The new eco-Solvent range will consist of three widths: 1.6M with one print head, and 1.6M, 2.5M and 3.2M, all with 2 print heads. The dye-sub will be available in 1.6M and 3.2M. The UK and Irish launch of the highly anticipated Mimaki JFX200-2513 8' x 4' (2.4m x 1.2m) LED UV flatbed printer will take place on exclusive Mimaki distributor, Hybrid Services’ stand. 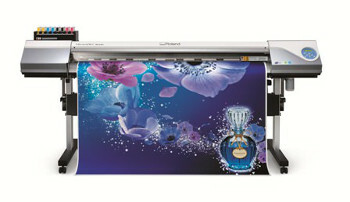 The company will also exhibit another first for the exhibition with the UK launch of the Mimaki UJV500, a roll-to-roll UV printer capable of high production volumes that is aimed at the wallcoverings, vehicle wrap and display graphics markets. InkTec Europe will launch the latest in the Jetrix range of UV printers, the Jetrix KX7-D. The KX7-D follows on from the launch of the KX7 in January this year and InkTec said it offers the potential for even faster print output, with genuine production speeds capable of printing at 60 m2/h. The maximum sheet size is 2.5m x 3.05m, with an optional 2.2m roll-to-roll system, which should make this model an alternative choice for sign-makers and POS providers. InkTec added that this printer, along with all the other models in the Jetrix range, now come with a two-year manufacturer’s warranty as standard. Colourgen will be premiering the latest Mutoh ValueJet wide-format printers, including the launch of the new ValueJet 1638X. Targeted at long-term outdoor and indoor sign and display applications, the printer integrates a newly developed mainboard allowing faster data communication and data processing. The 1638X also boasts advanced print automation features, courtesy of Mutoh’s Intelligent Interweaving and the new DropMaster technology. This new printer is specifically aimed at volume users, with a production print speed starting at 10 m2/h at 1080x1440 dpi and goes up to 15, 20, 29 and 36 m2/h, the latter still at 720x720 dpi. QPS will be launching a brand new digital ink, the Nazdar 202 Series ink, which has been developed specifically for the Roland Soljet Pro4 XF-640 and XR-640 units and the Roland VersaCamm VSi range. The company pointed out that the plug and play solution is the first alternative ink to be colour matched to the Roland Eco-Sol Max 2 and offers excellent compatibility, quality and cost effectiveness, plus improved alcohol resistance and superior scratch resistance and rub resistance. 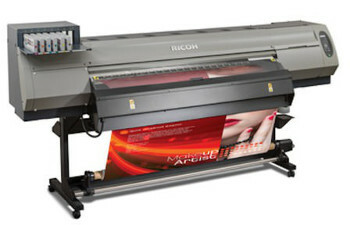 One of the big guns, Industry giant Ricoh UK will make its Sign & Digital UK debut appearance with a bang – unveiling the new Ricoh Pro L4100 Series large-format roll-to-roll printer (commercially available from April 2014). The new device is available in two models: 53" Pro L4130 or 63" Pro L4160 – and can support up to seven colours in various configurations. The stand will also be running a Ricoh Pro™ C751EX digital press, the MarcomCentral SaaS-based Marketing Asset Management (MAM) system and a portfolio of Business Driver tools. Another big name, Roland DG UK will be showcasing its first ever dedicated flatbed printer, the VersaUV LEJ-640F, which will be will be the printers public debut in the UK. The new flatbed VersaUV LEJ-640F is designed to offer printers and sign makers the flexibility needed to produce an extensive range of creative, vibrant and profitable applications. Such applications include outdoor and indoor signage, POS /POP displays, exhibition graphics, 3D and textured print and packaging prototypes. Sign & Digital UK is also offering an exclusive prize giveaway – a Roland VersaART™ RE-640 large format, inkjet printer package, worth more than £11,000. The prize will include a Roland VersaART™ RE-640 64” wide dual CMYK printer, installation and a set of inks. Also included with the prize is a place on the Intermediate Digital Print course at the Roland DG Academy and a one-year Roland warranty. Companies that pre-register at www.signanddigitaluk.com will automatically be entered into the prize draw, and must attend the show on 29th April, 30th April or 1st May to be eligible to win. The lucky company will be selected and informed in the month following the show.